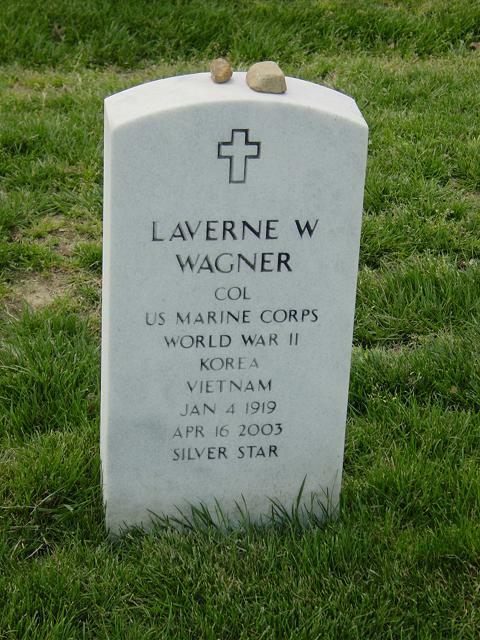 Laverne William "Vern" Wagner, Colonel, United States Marine Corps (retired), age 84, of Indianapolis, Indiana, died April 16, 2003. Colonel Wagner was born on January 4, 1919 in Galena, Illinois, to the late William S. and Emma (Harle) Wagner. He joined the Marine Corps Reserve in 1941. Upon graduation from Marquette University in June 1941, he went onto Quantico for the 3rd Officers Candidate class and was commissioned on November 1, 1941. After a tour of duty at the Recruit Depot in San Diego, he joined the 23rd Marines at Tent Camp, New River, North Carolina, and after making Captain, he assumed command of K company, 23rd Marines. He commanded K company during the landing assaults om Roi-Namur, Saipan, Tinian, and Iwo Jima. He was awarded the Bronze Star for Saipan and a Silver Star for Iwo Jima. After World War II he accepted a regular commission. In addition he served in Korea, commanding the 3rd Battalion 1st Marines and in 1961-63 as Fleet Marine Officer, Seventh Fleet, during the Vietnam Conflict. Colonel Wagner retired from the United States Marine Corps in February 1968. Following retirement from the Marine Corps he assumed the position of Business Manager and Comptroller at Marian College in Indianapolis; he served in that position from 1968 to 1983. Survivors include his wife, Alice Copley Wagner; children, William T. (Thom), Edward T. (Tim), Peter C. Wagner; grandchildren, Andrew, Emma, Hanna, and Christine Wagner. A burial with full military honors will be held at Arlington National Cemetery on May 7, at 9 a.m. Friends are asked to meet at the Administration Building by 8:45 a.m.